Home / IT Security / Extending Microsoft Active Directory Security in 2014 and beyond. For many organizations Active Directory is just the starting point when it comes to identity management and controlling and recording what users can do. Active Directory provides basis user security. It can check that credentials supplied match stored user profiles and then open access to different resources. Once a user is authenticated however, organizations need to apply further restrictions on what a user can or cannot do. Knowing who your users are and managing their access rights is central to effective IT security. In the following blog article, published in Computerweekly, Bob Tarzey from analysts Quocirca discusses how to extend security for Microsoft Active Directory with supplementary tools. 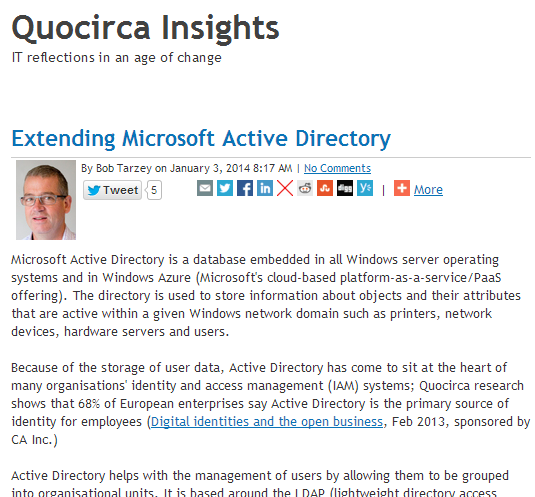 Extending Microsoft Active Directory – Quocirca Insights. Featured in the article is the access security solution UserLock from IS Decisions.